What’s your position at your brewery? I’m the founder of Allagash Brewing in Portland, Maine. 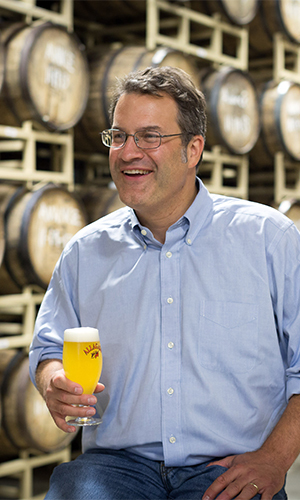 What’s new at Allagash, and what’s next on the horizon? In the craft industry as a whole, there is a tremendous amount of excitement. Seems like all craft brewers are feeling it, and there is so much going on at all of the breweries that I visit. One of the projects on our plate right now is 16 Counties, a beer we brew with all Maine-sourced barley, wheat, and oats. It’s been cool to support the local economy as well as small and sustainable agriculture. It’s exciting to be in a business where opportunities to do good locally are so plentiful! I’ve absolutely loved it, and I’m very passionate about the work the BA is doing for its membership. It has been fascinating and a lot of fun to spend time with fellow board members and BA leadership working through the challenges and opportunities that face our industry. It’s also been great to get to know the BA staff and see all of the enthusiasm they bring to their jobs every day! It is so important that we continue to improve on the stellar job that the BA has done to promote and protect our diverse membership. An important component of that effort is ensuring that the BA “owns” the term craft brewer, and to keep explaining the term to our customers. Our drinker sees a tremendous amount of value in the indie component of our craft brewer definition. We need to make sure that value is not diluted in any way. I’ve been learning (or at least trying to learn!) to surf. Portland, Maine is a great spot for surfing, even in the winter. I’ve gotten addicted pretty quickly!